You Want to Be a Better Hitter by Next Season, Right? I want to help you be a better hitter by next season. Now is the time to be working out, when everyone else is shopping for the holidays, complaining about the weather, etc. Commit to practicing from now until the tryouts begin. This should give you a month or two and if you're taking those 100 swings a day, don't you think 5,000 - 6,000 extra swings will get you better? Get some coaching. Find that person who can take you to the next level. I'm available in the Southern California area near Ventura, CA (805) 642-5827 or google "hitting coach" + your area. Or get some training books or DVD's. How About a Whole Hitting Store? Speaking of holiday shopping and finding training DVD's or books, if there was a hitting store that listed every item that Amazon sold that related to hitting, baseball, fastpitch, or slo-pitch training, techniques and equipment, is that something you'd find interesting? 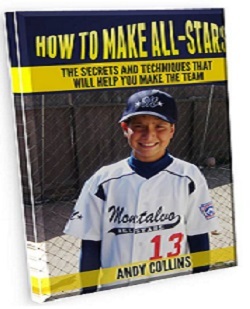 There wouldn't be a better time to motivate your child to work hard and attain the goal of making All-Stars, and you can get them just the gift to help them, my book on "How to Make All-Stars"
Until next time when we have more time. If you have any questions or comments you can call me at 805-642-5827 or write to me via e-mail. Coach Andy Collins has been helping players achieve their goals in softball and baseball for over 35 years. He's an advisor to national teams and can help you be a better hitter. He offers free information on his website www.theInternetHittingCoach.com and through free e-mail hitting lessons and has just written a book on How to Make All-Stars, the secrets and techniques that will help you make the team How to Make All-Stars book on Amazon.